We made wonderful felted soap-on-a-rope for our dads. 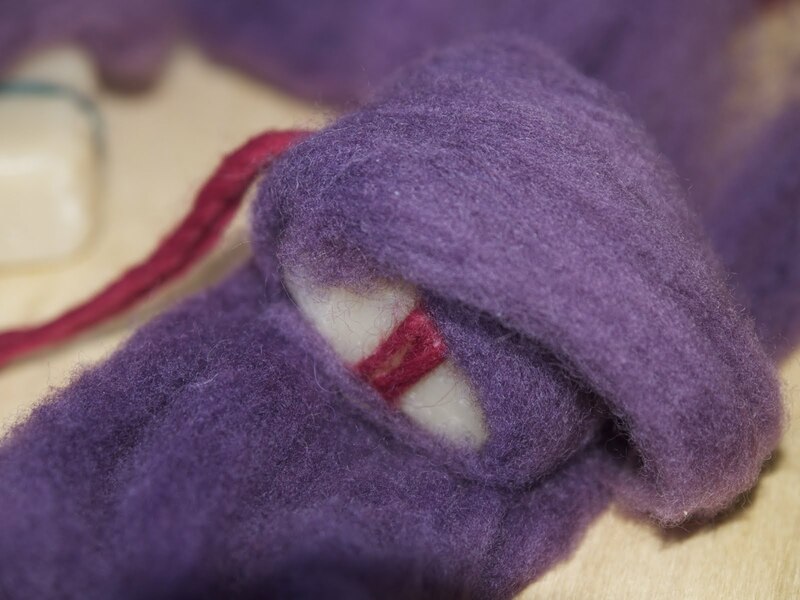 The children LOVED this project as it’s such a tactile activity… the wool, the soapy water… a child’s dream. We cut a long length of wool yarn and tied it around the soap, leaving a long loop at the top end of the bar for the *rope* part of our soap. Then, we placed a length of wool roving down. Made a little hole in it for the *roap* to pass through. Then we wrapped the soap in the wool, leaving the *rope* free on one end. We placed another length of roving down and placed the partially wrapped soap down on it, going the other way. We wrapped it again, making sure that the whole soap is now wrapped. Now for the fun part. First, we placed each wrapped soap inside a sock… any sock will do. Then, we dipped the soap filled sock into the warm water and agitated it, trying to make it nice and foamy. The children rubbed their soaps every which way… making sure to agitate the wool evenly. Soon they felt the wool inside the sock start to contract and firm up (felt). We took the partially flelted soap out of their socks and the children had another go at felting their soap-on-a-roap even more. Their hands got wonderfully foamy as they rubbed and rubbed on the delicious wool. When the wool had felted nicely around the soap, we rinsed them and hung them on the tree to dry in the sun. Voila! Don’t look Dad, but here is a wonderful soap-on-a-rope for Father’s Day. I love your blog. I am a fan of the nature table and waldorf series. You have an award on my blog. What a wonderful idea. Thanks so much for sharing it. Hope you gave one to Dr Huxtable too!